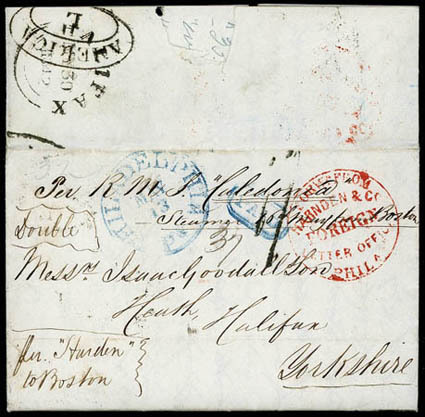 1842 (May 13) Philadelphia, Pa. to Halifax, England, datelined folded letter endorsed "per. "Harnden" to Boston" and bearing blue"Philadelphia, Pa. May 13" cds and matching boxed "Paid" handstamp with manuscript "37" rating for double 18¾¢ postage, red "Forwd. From, Harnden & Co. Foreign Letter Office, Phila." circular handstamp and taken to Boston by Harnden & Co., carried by Cunard Line Caledonia from Boston May 16th to Liverpool arriving May 29th, scarce Liverpool "America / L" double-oval backstamp and matching "1/-" shilling packet rating, Halifax (5.30) arrival backstamp, fresh and Very Fine with an unusually clear strike of the Harnden's Philadelphia marking in red. Harnden did a brisk business between Philadelphia and Boston by carrying letters in bulk. A link back to Sale 75 - Lot 197, along with its description, will be appended to your message.